The seventh annual 40 Mile Swim Challenge ended September 30 on a beautiful Sunday afternoon. This season saw 58 swimmers reach or exceed their 40 mile goal, our first youth swimmer to reach his goal, and the highest total miles swam by participants ever: 3709. Last year we had 57 swimmers reach the goal with total miles swum: 3237. Leading the pack, once again, was Jessica Landisman Williams, who swam a whopping 251 miles between May 5 and September 30. That’s four miles past Edisto Island, South Carolina (as the crow flies from Decatur GA). Several people have reported seeing the beginnings of gills and fins growing on Jessica. Hot in Jessica’s wake was Gabriel Ramirez who achieved a new personal record of 128 miles. Muy Bueno, amigo. Dr. Bill Sexson, age 72, swam 112 miles while also teaching medicine and seeing patients at Emory. Rick “No Fins” Alembik, Janet Fath, and Jennie Richardson all swam 100 miles each. In all, six people defied rain and thunder closings, swim meets, and other events, to swim 100 miles or more in just 5 months. Finally, you might not have noticed the framed picture that has been in the 40 Mile Swim Challenge kiosk for the past month or more (shown at top). 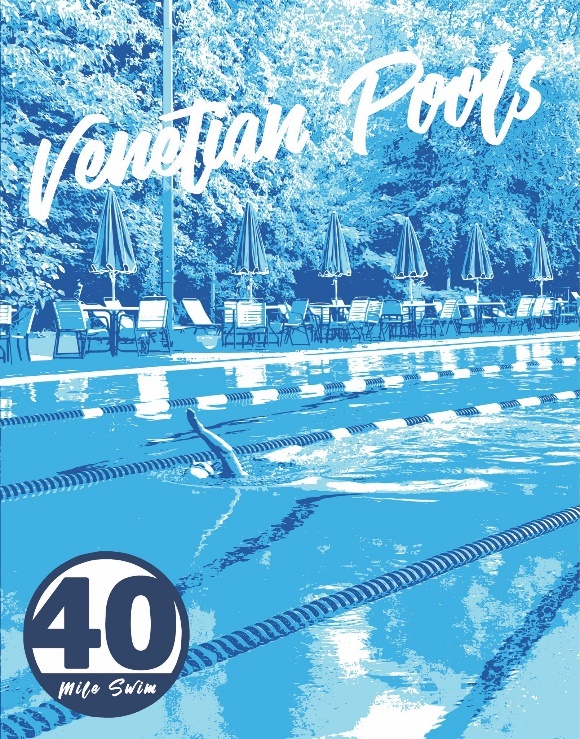 This is the beautiful poster designed by our own Colm Jenkins and screen printed by Colm and Fabiana Lara just for this year’s 40 mile swimmers. It really captures the feeling of swimming at our wonderful pool, like no other in Atlanta, surrounded by trees and sparkling in the sun. (Who the swimmer is, Colm doesn’t know, so I call it the Universal V Swimmer.) We hope to hang it in the check-in area of the office so that it will be a permanent part of the Venetian décor. Colm designed the poster so that it fits in a ready-made frame, easily found at Michael’s, Target, and other stores. Just look for one with an 11” by 15” opening. When taping it to the mat, it’s best to use acid-free or artist’s tape which you can buy at any art supply store. Now that we’ve entered the Waiting for Venetian to Reopen season, you can start planning for our Winter Reunion, to be held sometime in January. Further details to come as well as an announcement of the 2019 prize for completion of 40 or more miles which is something you will love. Have a good winter, everyone.